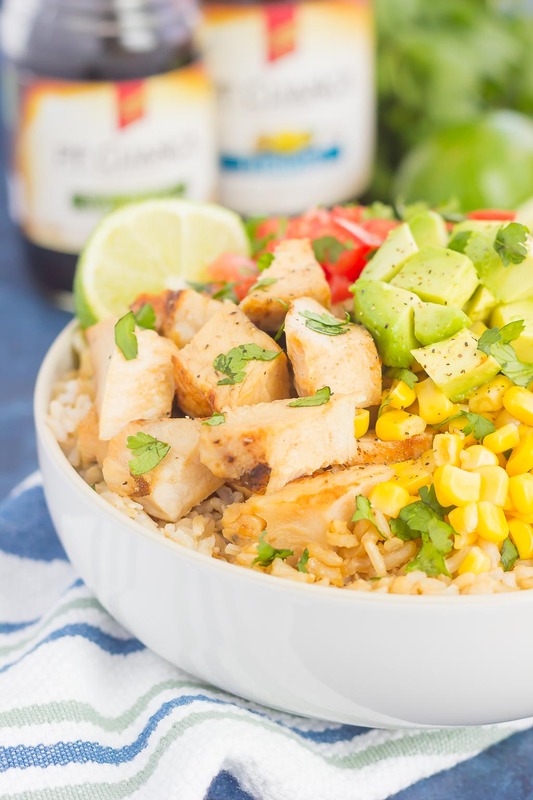 Skip the takeout and make your own Easy Chicken Burrito Bowl at home! It’s loaded with juicy chicken, cilantro lime rice, black beans, corn, fresh tomatoes, and avocado. Drizzled with a soy sauce marinade and ready in no time, this meal is sure to become a family favorite! Let’s talk about chicken today, shall we? It’s the meat that I cook the most in my kitchen, yet order at a restaurant the least. It’s flavorful, yet boring to me. And I think it’s safe to say that I have a love/hate relationship with it. Chicken in soup? Sign me up! 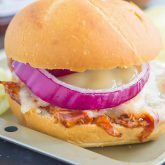 Shredded chicken for sandwiches? You betcha. Chicken in a cozy casserole or as a fried strip or nugget? It was made for me. But, chicken breasts, chicken cutlets, or anything else of the kind…it’s too plain and boring for me. Whenever the hubster suggests chicken for dinner, I silently, or really not-so-silently, groan and try to think of new ways to spice it up. Remember when I said that I don’t order chicken out? That’s true…I really don’t. Unless it’s smothered in cheese, a zesty sauce, or topped with lots of mushrooms. So, in order for me to make it at home, it’s gotta be really good (like these Chicken and Spinach Pesto Quesadillas, those Baked Chicken Ranch Taquitos, or this One Pot Chicken Fajita Soup). When I was shopping at Walmart last week, I stumbled across NEW P.F. Chang’s Home Menu® Sauces. Have you tried them? 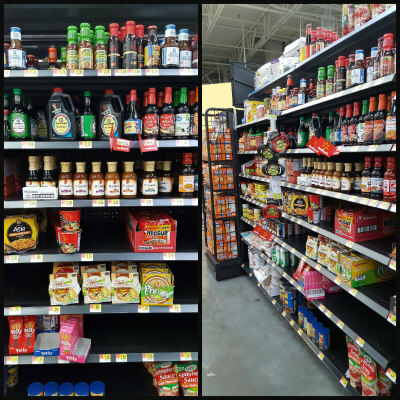 Soy and Mongolian are their newest flavors, but Teriyaki, Kung Pao, and Sesame round out their delicious sauces. P.F. Chang’s Home Menu® Sauces contribute to “Authentic Cuisine made easy” and that’s just what I’m looking for in a sauce. And because the hubster and I love foods with flavor, I though I would try P.F. Chang’s Home Menu® Soy Sauce for an easy meal idea. After all, the hubster loves chicken, and I’m always on the hunt to jazz it up a bit! To learn more about these delicious sauces, head over to this site to see more! And you know me, I’m all about the easy meals! I also love anything with jazzed up flavors, so I knew P.F. 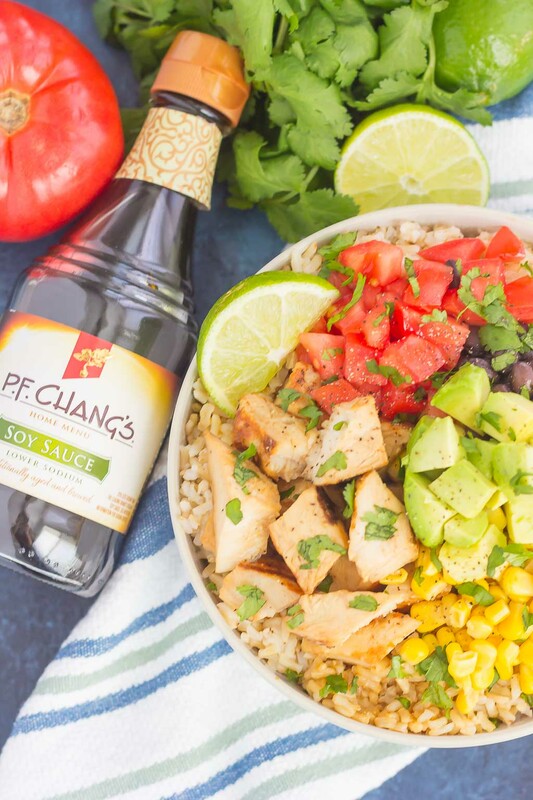 Chang’s Home Menu® Soy Sauce would be perfect to use in this Easy Chicken Burrito Bowl. The name pretty much says it all, friends. This burrito bowl is easy to make and perfect to customize depending on your tastes. It will also save you the time and effort of waiting in that drive-thru line or waiting for takeout. This bowl is fast, fresh, and flavorful. P.F. Chang’s Home Menu® Soy Sauce gives the chicken just the right amount of flavor, making it the star of this bowl. 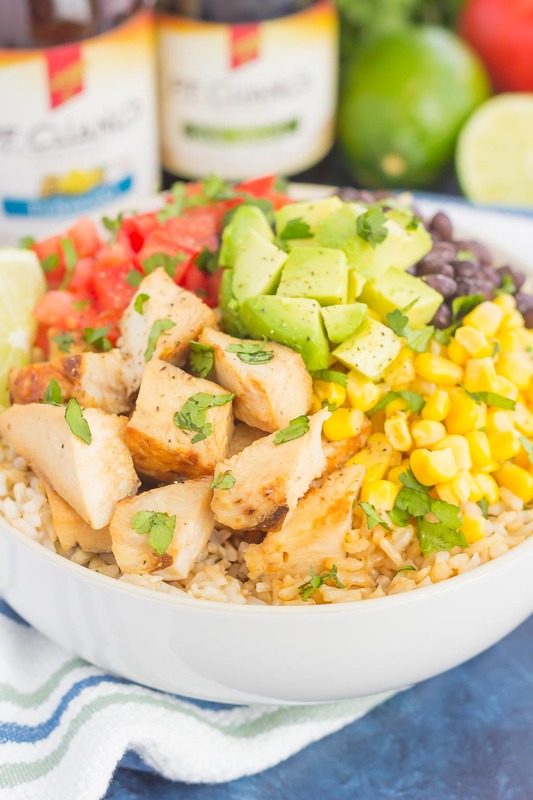 Did I mention how simple this Easy Chicken Burrito Bowl is to make? I marinated two chicken breasts in P.F. Chang’s Home Menu® Soy Sauce for about a half hour before cooking it. Once the chicken is cooked, simply slice and layer on top of some cilantro lime rice. I used brown rice for this bowl, but white would work just as well. Once the rice is cooked, toss it with some freshly chopped cilantro and lime juice. Layer on the sliced chicken, and then add the toppings. I used a combination of black beans, corn, diced tomatoes, avocado, and a sprinkling of cheese. Easy peasy and oh-so good! So if you’re looking for the next meal-time winner, this Easy Chicken Burrito Bowl is sure to steal the spotlight. Grab those ingredients and get cookin’ today! 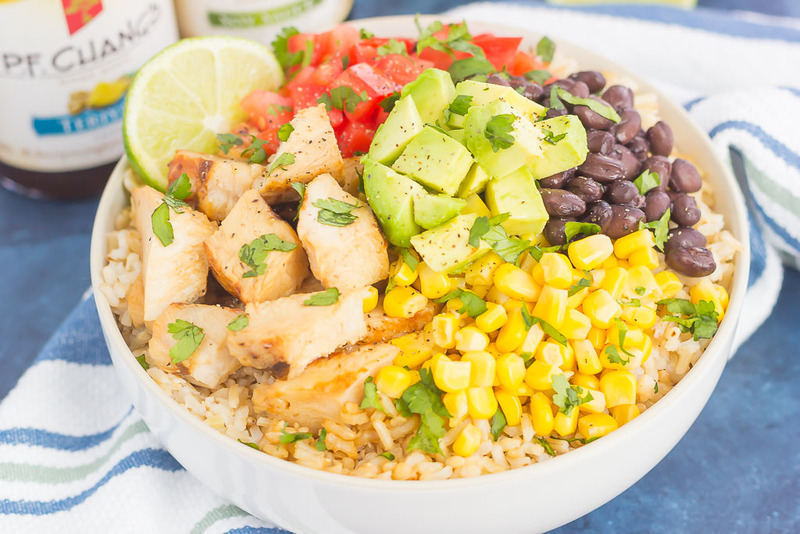 Skip the takeout and make your own Easy Chicken Burrito Bowl at home! It's loaded with juicy chicken, cilantro lime rice, black beans, corn, fresh tomatoes, and avocado. Drizzled with a soy sauce marinade and ready in no time, this meal is sure to become a family favorite! Place chicken breasts in a large ziploc bag, add P.F. Chang’s Home Menu® Soy Sauce, and seal bag. Gently shake bag to ensure chicken is covered with sauce. Refrigerate for at least 15 minutes. To cook chicken, heat olive oil in a large skillet over medium heat. Add chicken and cook for 3-5 minutes on each side, or until lightly browned. Cover skillet and cook for 7-8 more minutes, or until cooked through. Remove chicken to a cutting board and let rest for 5 minutes. Then, slice chicken and set aside. To make cilantro lime rice, add cooked rice to a medium bowl. Add cilantro and lime juice and toss to coat. Divide rice among two bowls. 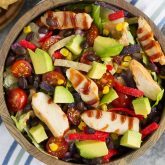 Top each bowl with chicken slices, shredded cheese, black beans, corn, tomatoes, and avocado. Like what you see? Then be sure to head to your nearest Walmart to see their collection of P.F. 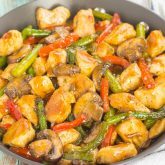 Chang’s Home Menu® Sauces! Sounds great! I love meals like this that include a variety of flavors, textures, and colors. Keeps the mouth happy! I cook chicken at home a lot, but I never order it out either. No offense to the chicken, but it's just not special enough to warrant the price tag at a restaurant. 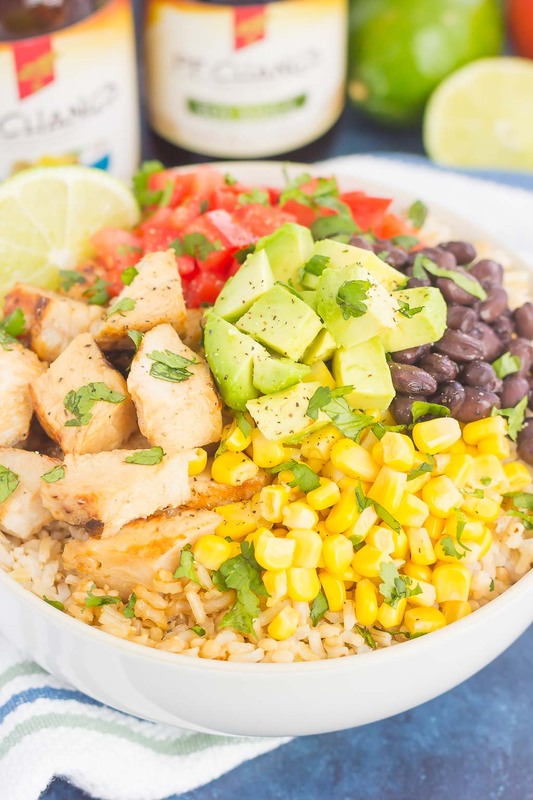 ;) These easy burrito bowls are total weeknight winning, Gayle!! Absolutely NOTHING boring about these bowls!! Pinning to try! Cheers! Haha I totally agree! :) Thanks, Cheyanne! 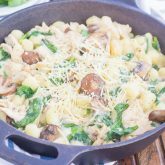 This is SUCH a fun and flavorful way to spice up chicken dinner night! I'll never say no to a gorgeous loaded burrito bowl!! What a beautiful and delicious bowl! Love it! Th PF Chang's sauces are so good! Pinned! Thanks, friend! Those sauces are my favorite! I love burrito bowls so much and these are packed with so many things I love! 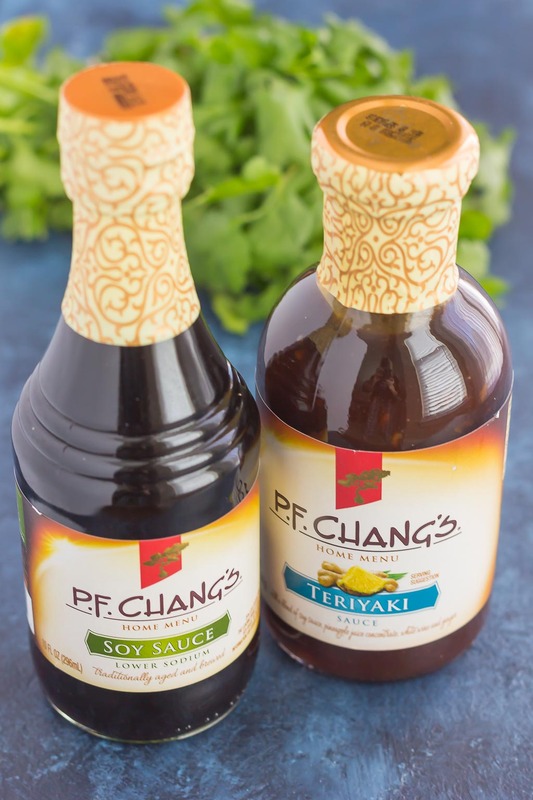 Those PF Chang sauces sound incredible and I really need to try them! I'm with you - I tend to never order it out either. It's got to be really good for me to get it at a restaurant!! ANYWAY. These burrito bowls sound delicious! A burrito bowl is what I order most often when we get Mexican, out - so having a recipe for home is exciting! My son will definitely love this! Pinned! This bowl contains some of my all-time favorite ingredients and I am truly inclined to try it! Excellent recipe, Gayle! Thanks for the burrito bowl love, Agness!